Only a couple of years ago the AIC led Local-Market group considered that around 30,000 trays per week was the level at which consistency could be maintained, values stabilised and the world was at peace. Above that volume, repeatedly, price pressures occurred. Looking at today’s volumes we see 50,000 trays entering the market, week in and week out – yet pricing has remained stable, consumption through retail and food-service has been continuous, and sustainable returns are being remitted to growers. This is undoubtedly a sign that the New Zealand market continues to develop with retail programmes that are effective through both chains. Clearly fruit entering the market is, in most cases, suitable for purpose. Ripening is now the norm so consumers are getting a product that is to their satisfaction. A sign of the advancing development of our market can be observed in pricing this season. It’s commonly accepted that we have a fruit profile sitting closer to size 20 than to size 24. Size 28 fruit is almost a rarity. As we look across our stock numbers, inward packing volumes and pricing we are seeing a marketing strategy that is almost ‘line-pricing’ these three sizes. 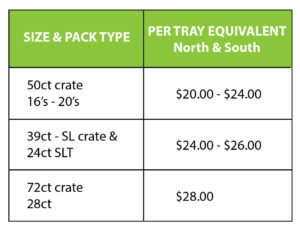 I have to admit that’s a challenging concept to understand however for this season a 28 sized tray will achieve a far better OGR value than a size 20 tray. In saying that, returns for both sizes are still excellent for the early stages of October. Looking ahead, the real challenge for domestic marketers is to maintain volume. Export discussion is currently focused around a slow-down in packing for the heavily supplied Australian market with a potential cut back in packing activity. That doesn’t suit us at all. 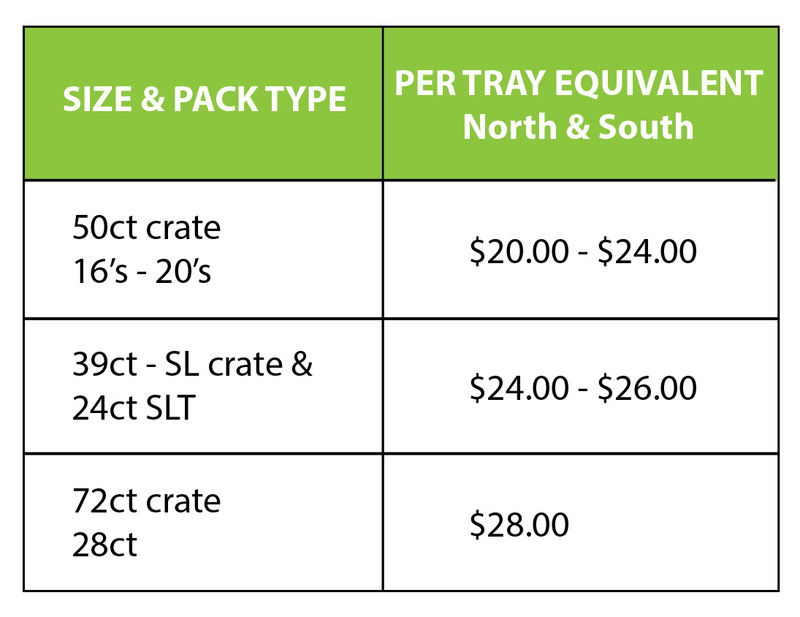 At a market volume of approximately 50,000 trays per week, growers may well be advised to look to their own back-yard (NZ) and take sustainable domestic returns with quicker payment time-frames.